Rehabilitation of the athlete consistently challenges athletic trainers to expand to new and exciting rehabilitation techniques. It is widely accepted in the athletic training community that an integrated approach to rehabilitation is what gives the modern athlete the strength and coordination to have a safe return to sport, and quite possibly a preventative approach to future injury. An integrated approach examines the incorporation of core strength with both upper and lower extremity rehabilitation. Incorporating movements into rehabilitation that challenge the area of pathology with areas that are healthy and strong. Integration of kettlebells is a dynamic functional rehabilitative way to help to maintain mobility, build stability, and build strength in your patient population. Mobility is defined as the ability to move freely and easily. Stability is defined as not likely to change or fail. In our world of rehabilitation this means the ability to withstand a potential force and finally the definition of strength meaning physical power or energy. With the integration of ketttlebells we can get all three for the price of one. Begin with the use of the kettlebell dead-lift. This movement is the foundation of the kettlbell swing. It all starts with the hips. This movement helps to pattern the hip hinge in patients to help protect their back. Saving patients back from stresses should be on every clinicians mind. Second is the grip on the handle of the kettlebell. With a tight grip this activates the inner and outer core and also activates the rotator cuff of the shoulder and finally the latissimus dorsi in the back. This basic strength movement can help pattern mobility and stability in all basketball athletes. It can help to build strength and stability while down low in the post while the big men are battling for that last second rebound to win the game. Can you ask for any more of an integrated exercise? Why yes you can, please keep reading! Now that you have patterned the movement of the kettlebell dead-lift, move on to the kettlebell swing. The kettlebell swing incorporates several aspect of the rehabilitation for your patient. First, your patient worked so hard on the glute bridge in the beginning stages of your rehabilitation, activation of the glute complex to decrease activation in the hamstring musculature. The patient then turned prone and worked on building that prone plank. You had that patient performing prone planks for a minute or even more. The core was on, the latissimus dorsi engaged. Little did you know you were already helping to build stability and strength for your patient to perform the kettlebell swing. The kettlebell swing is your answer to a dynamic functional glute bridge and plank with activation of the latissimus dorsi. We all know through reading the literature posted here on BSMPG and through Stuart McGill that the latissimus has an active role in core stability. The Kettlebell swing = Hip hinge and glute bridge + plank + latissimus dorsi activation in a dynamic functional movement pattern. The kettlebell swing is also a wonderful tool to build on metabolic training. At times the basketball athletes can raise the heart rate to 70-80% of max heart rate while reaching the final seconds of a minute of continuous 2 Hand swings. This can help to pattern the ability of the athlete to transition on the court. It can also help to train them in maintaining perfect form while under the demands of stress. Begin to work these kettlebell movement patterns into your training program for all your basketball athletes and begin to see the huge benefits that can be gained from working with this tool. Given the population that Boston Sports Medicine and Performance Group reaches out to and focuses on it is important to examine male emergencies in men’s basketball. A male emergency all athletic trainers working with basketball should be aware of is testicular torsion. Testicular torsion is a true urologic emergency and must be differentiated from other complaints of testicular pain because a delay in diagnosis and management can lead to loss of the testicle. Though testicular torsion can occur at any age, including the prenatal and perinatal periods, it most commonly occurs in adolescent males; it is the most frequent cause of testicle loss in that population. The testicle is covered by the tunica vaginalis, a potential space that encompasses the anterior two thirds of the testicle and where fluid from a variety of sources may accumulate. The tunica vaginalis attaches to the posterolateral surface of the testicle and allows for little mobility of the testicle within the scrotum. In patients who have an inappropriately high attachment of the tunica vaginalis, the testicle can rotate freely on the spermatic cord within the tunica vaginalis (intravaginal testicular torsion). This congenital anomaly, called the bell clapper deformity, can result in the long axis of the testicle being oriented transversely rather than cephalocaudal. This congenital abnormality is present in approximately 12% of males, 40% of whom have the abnormality in the contralateral testicle as well.1 The bell clapper deformity allows the testicle to twist spontaneously on the spermatic cord. Torsion occurs as the testicle rotates between 90° to 180°, causing compromised blood flow to the testicle. Complete torsion usually occurs when the testicle twists 360° or more; incomplete or partial torsion occurs when the twisting is less than this. The twisting of the testicle causes venous occlusion and engorgement as well as arterial ischemia and infarction of the testicle. How tightly the testicle is twisted appears to correlate with how quickly the testicle becomes nonviable from ischemia. • Early diagnosis and prompt urologic consultation is essential since time is critical in salvage of the testicle. • Analgesic pain relief should be administered as testicular torsion is typically very painful. • Attempt manual detorsion with pain relief as the guide for successful detorsion. The procedure is similar to the "opening of a book" when the physician is standing at the patient's feet. • Most torsions twist inward and toward the midline; thus, manual detorsion of the testicle involves twisting outward and laterally. • Consultation with urology is a must since most testicular torsion need surgical intervention. The unique aspect of being an athletic trainer is that it involves being well educated on all aspects of medical emergencies in the population we provide care. Medical emergencies related to orthopedic and internal medicine. It is all about early recognition to provide efficient and appropriate care. Dogra V, Bhatt S. Acute painful scrotum. Radiol Clin North Am. Mar 2004;42(2):349-63. [Medline]. Ringdahl E, Teague L. Testicular torsion. Am Fam Physician. Nov 15 2006;74(10):1739-43. [Medline]. Beni-Israel T, Goldman M, Bar Chaim S, Kozer E. Clinical predictors for testicular torsion as seen in the pediatric ED. Am J Emerg Med. Sep 2010;28(7):786-9. [Medline]. Cattolica EV, Karol JB, Rankin KN, Klein RS. High testicular salvage rate in torsion of the spermatic cord. J Urol. Jul 1982;128(1):66-8. [Medline]. Coley BD. The Acute Pediatric Scrotum. Ultrasound Clinics. 2006;1:485-96. [Full Text]. Hayn MH, Herz DB, Bellinger MF, Schneck FX. Intermittent torsion of the spermatic cord portends an increased risk of acute testicular infarction. J Urol. Oct 2008;180(4 Suppl):1729-32. [Medline]. Creagh TA, McDermott TE, McLean PA, Walsh A. Intermittent torsion of the testis. BMJ. Aug 20-27 1988;297(6647):525-6. [Medline]. Schmitz D, Safranek S. Clinical inquiries. How useful is a physical exam in diagnosing testicular torsion?. J Fam Pract. Aug 2009;58(8):433-4. [Medline]. Brenner JS, Ojo A. Evaluation of scrotal pain or swelling in children and adolescents. UpToDate [web site]. 2006. Eyre RC. Evaluation of the acute scrotum in adults. UpToDate [web site]. Doehn C, Fornara P, Kausch I, et al. Value of acute-phase proteins in the differential diagnosis of acute scrotum. Eur Urol. Feb 2001;39(2):215-21. [Medline]. Prando D. Torsion of the spermatic cord: the main gray-scale and doppler sonographic signs. Abdom Imaging. Sep-Oct 2009;34(5):648-61. [Medline]. Dogra VS, Bhatt S, Rubens DJ. Sonographic Evaluation of Testicular Torsion. Ultrasound Clinics. 2006;1:55-66. Yagil Y, Naroditsky I, Milhem J, Leiba R, Leiderman M, Badaan S, et al. Role of Doppler ultrasonography in the triage of acute scrotum in the emergency department. J Ultrasound Med. Jan 2010;29(1):11-21. [Medline]. Turgut AT, Bhatt S, Dogra VS. Acute Painful Scrotum. Ultrasound Clinics. 2008;3:93-107. [Full Text]. Cassar S, Bhatt S, Paltiel HJ, Dogra VS. Role of spectral Doppler sonography in the evaluation of partial testicular torsion. J Ultrasound Med. Nov 2008;27(11):1629-38. [Medline]. Blaivas M, Sierzenski P, Lambert M. Emergency evaluation of patients presenting with acute scrotum using bedside ultrasonography. Acad Emerg Med. Jan 2001;8(1):90-3. [Medline]. Bomann JS, Moore C. Bedside ultrasound of a painful testicle: before and after manual detorsion by an emergency physician. Acad Emerg Med. Apr 2009;16(4):366. [Medline]. Capraro GA, Mader TJ, Coughlin BF, et al. Feasibility of using near-infrared spectroscopy to diagnose testicular torsion: an experimental study in sheep. Ann Emerg Med. Apr 2007;49(4):520-5. [Medline]. Terai A, Yoshimura K, Ichioka K, et al. Dynamic contrast-enhanced subtraction magnetic resonance imaging in diagnostics of testicular torsion. Urology. Jun 2006;67(6):1278-82. [Medline]. Moschouris H, Stamatiou K, Lampropoulou E, Kalikis D, Matsaidonis D. Imaging of the acute scrotum: is there a place for contrast-enhanced ultrasonography?. Int Braz J Urol. Nov-Dec 2009;35(6):692-702; discussion 702-5. [Medline]. Baker LA, Sigman D, Mathews RI, et al. An analysis of clinical outcomes using color doppler testicular ultrasound for testicular torsion. Pediatrics. Mar 2000;105(3 Pt 1):604-7. [Medline]. Blank BH, Goldsmith G, Schneider RE. Recognizing a testicular emergency. Patient Care. 1997;31(13):117-35. Brenner JS, Ojo A. Causes of scrotal pain in children and adolescents. UpToDate [web site]. 2006. Caesar RE, Kaplan GW. Incidence of the bell-clapper deformity in an autopsy series. Urology. Jul 1994;44(1):114-6. [Medline]. Cattolica EV. Preoperative manual detorsion of the torsed spermatic cord. J Urol. May 1985;133(5):803-5. [Medline]. Flanigan RC, DeKernion JB, Persky L. Acute scrotal pain and swelling in children: a surgical emergency. Urology. Jan 1981;17(1):51-3. [Medline]. Kadish HA, Bolte RG. A retrospective review of pediatric patients with epididymitis, testicular torsion, and torsion of testicular appendages. Pediatrics. Jul 1998;102(1 Pt 1):73-6. [Medline]. McCollough M, Sharieff GQ. Abdominal surgical emergencies in infants and young children. Emerg Med Clin North Am. Nov 2003;21(4):909-35. [Medline]. Schwab R. Acute scrotal pain requires quick thinking and plan of action. Emerg Med Rep. 1992;13(2):11-7. Wan J, Bloom DA. Genitourinary problems in adolescent males. Adolesc Med. Oct 2003;14(3):717-31, viii. [Medline]. Weber DM, Rosslein R, Fliegel C. Color Doppler sonography in the diagnosis of acute scrotum in boys. Eur J Pediatr Surg. Aug 2000;10(4):235-41. [Medline]. More and more as research develops and studies get published athletic trainers acquire tools to be more efficient and evidence based. One such tool established is the clinical prediction rule. Clinical prediction rules have been developed for many areas. One such area is the Canadian C-spine Rule (CCR) that has been published since 2003. With the publication of this clinical prediction rule we have evidenced based guidelines to send our patients for radiography of the cervical spine. These guidelines give athletic trainers an evidenced based approach to sending an athlete for radiographs of the cervical spine. • The first of the three is an age-factor, deeming any patient who is 65 years old to be at high risk. • The second factor looks for any dangerous mechanism, including a fall from a height greater than 3 feet, a high-speed motor vehicle collision (greater than 100km/hr, with or without rollover or ejection), an accident involving a bike or motorized recreational vehicle, or a direct axial load that would place the patient at high risk for a C-spine injury. • The third high-risk factor is paresthesias in any or all extremities. If any of the three high-risk factors applies to the patient, the CCR mandates radiography. If the patient lacks any high-risk factor, the CCR then evaluates the patient for the presence of any low-risk factor that will eventually allow for safe assessment of cervical range of motion. • The published low-risk factors are simple rear-end motor vehicle collisions, a patient found sitting in the Emergency Department or ambulatory after the accident, delayed onset of neck pain or absence of any midline cervical pain. If none of these low-risk factors applies to the patient, the CCR mandates radiography. If, however, the patient has no high-risk factor and does have at least one low-risk factor, the CCR then assesses the patient’s ability to actively rotate their neck, both left and right, at a 45° angle, with or without pain. • If the patient is physically unable to perform this exercise, radiography is indicated. If the patient can perform this manipulation, however, the CCR recommends that no radiography is necessary to rule-out significant cervical spine injury. • Athlete is under cut while coming down from a dunk. Athlete lands on the head, cervical, and thoracic area of the neck and upper back. While clearing head and neck and calming the injured athlete the CCR flow cart could easily be used in your clinical on-court evaluation. • Athlete is diving for a loose ball and collides with another player. 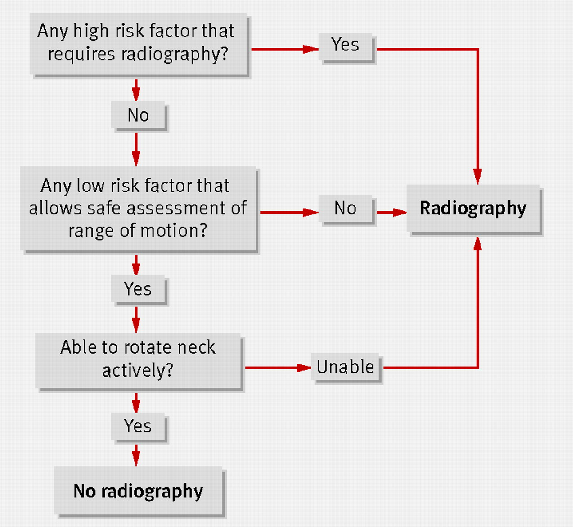 This is a situation that could pass the athlete on the first area of the flow chart, but when assessing for cervical mid-line pain and also active rotation is not possible, you send for radiographs. for alert and stable trauma patients. JAMA 2001; 286: 1841-8. Journal of Medicine 2003; 349: 2510-8.
departments. Annals of Emergency Medicine 2004;43: 507-514.
of cervical spine injury in children. Pediatrics 2001;108: e20. 8. State of Maine Spinal Assessment Protocol. Maine EMS 2002.
criteria to rule out injury to the cervical spine in patients with blunt trauma. New England Journal of Medicine 2000; 343: 94-99. Critical Care 2005; 59: 1396-1399. 11. Ngo, B, Hoffman, JR, Mower, WR. Cervical spine injury in the very elderly. American Society of Emergency Radiology 2000; 7:287-291. 12. Eyre, A. Overview and Comparison of NEXUS and Canadian Spine Rules. American Journal of Clinical Medicine 2006; 3: 12-15. How did you get into the field of Sports Medicine? Like many in the profession of athletic training I was introduced to the world of sports medicine through my own personal injury. I was a high school athlete that tore my ACL while playing in a football game as a sophomore in high school (1993-94). I had all the classic signs and symptoms of a typical torn ACL, but unlike today I had no help as to what the “pop” was in my knee at the time of injury. At a young age I became determined to find out if there was a better way for assessment of injury on the sideline of a sporting event. I started the process of researching professions. I started out with shadowing physical therapists. It was interesting to see all the assessment skills and rehabilitation techniques but it lacked a certain luster I was after. I continued with my research and came upon the profession of athletic training. I found a local athletic trainer to go shadow and it became my passion from that day on. I was impressed by the advanced assessment skills of the athletic trainer and also the rehabilitation skills. The rehabilitation skills that begin at the time of injury and continue through to the return to play. I began reading articles in the Journal of Athletic Training and visiting undergraduate institutions that supported a bachelors of science in athletic training. Since graduating from Canisius College in 2000 with my BS in athletic training and University of Kentucky in 2002, my passion for the profession has not stopped. I am continuously searching for new ideas and techniques that can progress me to the status of a great athletic trainer. Most of my clinical skills come from evidence based medicine to help to make a precise and effective health care provider. As we all know time is a valuable thing to an athletic trainer and the athletes we treat and rehabilitate. As with everything in the health care setting my skills are constantly in the evolution process. I like to think that I am constantly changing and adapting my assessment and rehabilitation skills to match the needs of athletes today. How has your philosophy changed in the past three to five years? Three areas that have changed are first my assessment of function in my initial evaluation. In the past I tended to have an athlete lay passive on the treatment table as I went through my assessment techniques. While palpation of anatomy is extremely valuable, and focusing in on the area of pathology, following my assessment of each athlete they rise off the table and I assess function. Assessing for muscular dysfunction and inactivation, through several closed kinetic chain movement patterns either upper extremity, lower extremity, or an integrated upper and lower body movement. Having the patient rise off the table and be part of the assessment is engaging for both the athlete and the athletic trainer. Upper extremity I might see scapular dysfunction and determine an appropriate rehabilitation, while lower extremity I might detect a gluteal dysfunction that might need to be addressed with an appropriate muscular activation. Second, I have changed my approach to the rehabilitation of the core musculature. This change came two years ago when I attended a lecture series hosted by advisory board member Art Horne. The lecture series brought in Stuart McGill from the University of Waterloo. His evidence on core training was ground breaking in my mind. After seeing Dr. McGill lecture I now had great new techniques to assess muscular activation in the core. I also now understood we need to take an injury prevention approach through developing endurance in the core. I cannot emphasis enough how much more successful I have been in rehabilitating the core and then developing injury prevention techniques in the athletic population through following Dr. McGill’s evidence. Whether the patient is post surgical or fully functional the core is always assessed and appropriate activation techniques are utilized to ensure this area is never compromised. A must read for every athletic trainer is Dr. McGill’s textbook: Low Back Disorders. This text never acquires any dust on my bookshelf! The last area that has changed in recent years through current evidence is my approach toward closed kinetic chain functional training. I now use the term integrated training when reaching the final stages of rehabilitation. I like to integrate several different systems of the human body while rehabilitating an injury. This includes using proper muscle activation, joint and muscle range of motion, joint mobility, and balance. This approach uses both upper and lower extremity in the process of rehabilitation. While using both upper and lower body activation we must include the core to progress the athlete properly. My techniques of an integrated rehabilitation can include thera-band or my favorite the Russian kettlebell. The Russian kettlebell when incorporated properly and with proper weight for rehabilitation can be an extraordinary in incorporating all areas described in an integrated rehabilitation approach. With proper activation of the core through integrated rehabilitation we give the upper and lower extremity a strong stable base to perform. This also, in theory, can lead to improved time of rehabilitation, which can lead to quicker, healthier, and more efficient return to full activity of the athlete. A valuable read for all athletic trainers to begin the process of learning the movement patterns with Russian kettlebells is: Enter the Kettlebell! by Pavel Tsatsouline. Please discuss your philosophy on taping/bracing. Does this cause problems elsewhere? What are the advantages of taping/bracing? Currently my philosophy on taping and bracing is that I implement it on each player. In the past year I have switched to Power Tape and it seems to be holding up to the claims it made as compared to conventional taping methods. First off, the product has evidence to prove its supportive abilities do hold up during and after athletic events. Athletes like the product and are more compliant to come in and get taped up. The product does hold up to a three hour practice with the most profuse sweating of an athlete, and in fact seems to have better breathe-ability for the athlete also. I do not believe that taping and bracing causes problems elsewhere. I believe the advantages of taping or bracing include supporting of the ankle in an athlete with previous history of inversion ankle sprains, compressive abilities against the foot, ankle and lower leg to possibly increase the activation of the musculature in the area to help prevent or control an ankle injury better. How do you address knee pain the basketball athlete? It begins with a detailed history of the injury. Things such as when and where the pain is? Are there specific activities of daily living that cause pain? Are there specific athletic activities that cause pain? Was there a specific time when you remember doing something that caused the pain to begin in the knee. I then proceed to take a comprehensive look at the knee both orthopedic evaluation and functional evaluation. My functional evaluation is sometimes where we get to the root of the knee pain. I will assess ankle mobility, knee stability, hip mobility, and finally core stability all through functional movement patterns. These areas must be working in conjunction with one another to help solve the athlete’s history of knee pain. There may be a anterior and posterior core activation issue, that leads to improper firing of the glute complex, which causes the knee to drop in a valgus pattern, and then causes a drop in the arch of the foot. You start at the top and address each issue and the athlete will get significantly better on the court and in life.